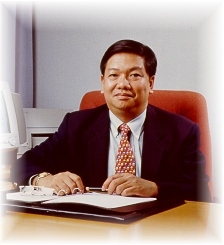 Associate Professor Supachai Yavaprabhas, Ph.D.
1976 Bachelor of Political Science (Hons. )Chulalongkorn University. 1984 Ph.D., Virginia Polytechnic Institute and State University. Secretary, Council of University Presidents of Thailand. Associate Professor, Department of Public Administration, Faculty of Political Science, Chulalongkorn University. Public Administration Society of Thailand. Secretary to the Minister, Ministry of University Affairs. Chairman, Department of Public Administration,Chulalongkorn University. Taught MPA courses at Chulalongkorn University and Thammasart University. Lecture at National Defense Academic, Army Academy,Mahidol University and others. Conducted consultancy services and research works for various Organizations including EGAT, Thai International Airways, Ministry of Science, Technology, and Environment, Office of Budget Bureau, Civil Service Commission, etc.